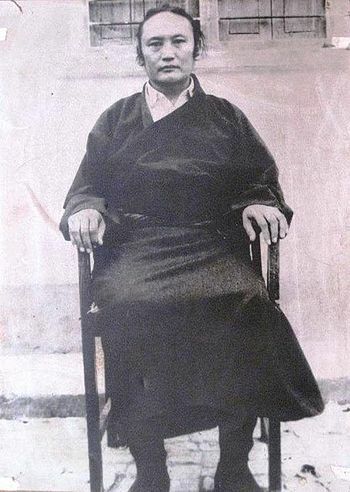 Pema Jigme Chöying Rangdrol aka the Second Degyal Rinpoche (1937-1980’s ?) was a main student of Golok Serta Rinpoche and his son. He stayed in the Namkha Khyung Dzong Monastery and became a main Dudjom Tersar lineage order of this area of Western Tibet. Pema Jigme Chöying Rangdrol was born in 1937 as a son of Golok Serta Rinpoche, the main student of Degyal Rinpoche, on the border of the lake Rakshas Tal, adjacent to Lake Manasarova, a place very close to Namkha Khyung Dzong in the Mount Kailash area of Western Tibet. This place was a small abandoned monastery called Tesgya where Golok Serta Rinpoche had settle with disciples, including Bartai Koungo Nyenye Yonten. Pema Jigme Chöying Rangdrol was recognized by many disciples of the previous Degyal Rinpoche, such as Bartai Koungo Nyenye Yonten, Khenpo Tashi, Khenpo Koushap Choden Rinpoche, Gueko Drime Oser, and Tenzin Gyaltsap Karma Dongak Rinpoche, and also by Dudjom Rinpoche. He was installed on the throne of Namkha Khyung Dzong Monastery during a cermeont which gathered nearly 3000 people, and with an elaborated ritual of Tröma Nakmo. Until the age of 17 years old, Pema Jigme Chöying Rangdrol studied the tradition of Namkha Khyoung Dzong with Golok Serta Rinpoche and all the main teachers of the area. Pema Jigme Chöying Rangdrol assumed being the lineage holder of Namkha Khyoung Dzong but in 1954, instead of staying a monk, he adopted the style of a tantric yogi: he took a wife to preserve his spiritual heritage through a family line. Due to the political events, Pema Jigme Chöying Rangdrol left Tibet and Namkha Khyoung Dzong monastery, which was going to be completely destroyed by the Chinese army. He choose to stay in the isolated region of Humla, in the northwest of Nepal, where his father Golok Serta Rinpoche had built a monastery. In Humla, he taught his sons and in particular Shiva Rinpoche, who had been recognized by Dudjom Rinpoche as the reincarnation of Golok Serta Rinpoche. He took care of Shiva Rinpoche and transmitted to him the whole “Dudjom Tersar” lineage, considering him his main lineage holder. Acoording to lineage stories, it is said that “Several times, Pema Jigme Chöying Rangdrol showed his spiritual accomplishments in an unconventional style but ordinary people saw the behavior of a “madman”, being unable to understand that what was an expression of the primordial wisdom, free of any conceptual limitation”. And many who were also students of Tsogkhang Rinpoche. At his death, it is said that “iridescent lights appeared in the sky” and that “after his cremation, many ringsel were discovered in the ashes as signs of his realization”. The Third Degyal Rinpoche aka Mingyour Dechen Duppe Dorje was born in August 27th, 1987 as the grandson of the Second Degyal Rinpoche, in the family of Gyepa Rinpoche. He was recognized by Dilgo Khyentse Rinpoche in 1990. He lives actually in Namkha Khyung Dzong (Nepal), in Humla, where he studies the tradition of Namkha Khyung Dzong. This page was last edited on 21 January 2019, at 22:23.